Tom Baxter in action for Boston. Photo: David Dales. Boston Cricket Club’s First XI will begin their Lincolnshire ECB Premier Division campaign by travelling to Woodhall Spa CC on Saturday, April 21. Tom Baxter’s Mayflower men finished seventh in the county’s top flight, with Woodhall claiming a top-four finish. The action at Jubilee Park will begin at midday. Boston and Woodhall will be joined by Alford in Group Four of the Winkworth Cup, the T20 event also taking place at Jubilee Park on Monday, May 7. The Second XI will also begin their season on April 21 , hosting Spalding Firsts in the South Lincs and Border League Premier Division. The Thirds will be up and running a week earlier. 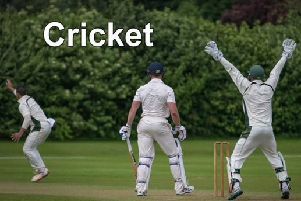 They entertain Belton Park Seconds at the Mayflower in the Soth Lincs and Border League Division Two on Saturday, April 14. Boston’s Sunday Firsts will be at home to Bracebridge Heath in the Lincoln and District League Premier Division on April 22. Freiston, Leake and Leverton CC will begin their 2018 SLBL Premier campaign at home to Skegness on April 14, with the Seconds hosting Belton Park Seconds in their SLBL Division Two contest on April 22. Promoted Graves Park CC will begin life in the SLBL Division One when they host Belton Park Firsts on April 21. Revesby will be competing in the Lincoln and District League’s Premier Division again. Their curtain-raiser will be at home against Cherry Willingham on Sunday, April 29.